Choosing your wedding theme is very important. Beach weddings and Tropical wedding themes give your guests the feeling that they are taking a short paradise vacation of their own while celebrating your union together with you. Your wording is surrounded by faded gray shells and words of love, creating a carefree feeling of romance on this white card invitation. A wedding at the beach is all about romance with this sweet starfish design invitation. Are you having a beach wedding? 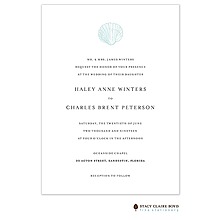 Then this beautiful seal 'n send wedding invitation is just what you need! Value style and save with this invitation card. Your reception information listed on the backside of the invitation with the option to add directions to your reception and a separate respond card. Having a fun destination wedding? Then this cute wedding invitation featuring a beach scene is just what you need!